ReNew Family Consignment helps members of the community make and save money through consignment sales. 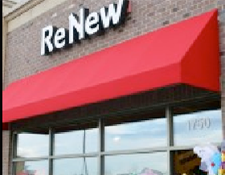 ReNew carries new and lightly used furniture and home decor, women’s accessories, sporting goods and equipment andchildren’s specialty clothing. ReNew also provides opportunities for local organizations toraise fundswith consignment drives.